Do You Believe in Ghost…Ants? The colorful ant pictured above is the ghost ant (Tapinoma melanocephalum). They aren’t actually brightly colored ants, but the opposite; they are translucent. I had never heard of these ants until the other day in lab when another student mentioned that they were his favorite ant. When I asked what they looked like, he told me they were translucent! Of course I was interested, so I googled them. As it turns out, only their gasters really are translucent. 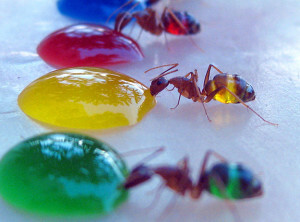 As you can see from the first picture above, when an ant drinks colored water, you can actually see the colored water inside of it! From looking at these incredible photos these ghost ants seem pretty cool. However, to most people around the world, especially those living in Florida, they are commonly known for being pests. These ants are super tiny and average lengths between 1.3 and 2.0 millimeters. They use their small size to fit into nearly all cracks and crevices in the home. They multiply rapidly, plus the second half of their already tiny body is clear, so of course these ants are nearly impossible to see. Not to worry however, recently there has been significant progress in ghost ant pest control. This next interesting ant is the trap-jaw ant (Odontomachus). 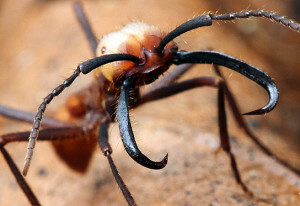 I am sure that now you can see why it is called the trap-jaw ant. Yeah, because of the giant pair of straight mandibles that stick 180 out of both sides of its face. The mandibles (jaws) are locked open by some type of internal mechanism. They snap shut if any type of prey touches the sensory hairs on the inside of their mandibles. Like other very predatory ants, like the army ants I talked about last week, these mandibles are used for killing or maiming prey. They also allow the ant to chop its food into smaller pieces so that they can bring it back to their nest. These mandibles are impressive, they have the fastest moving predatory appendages within the entire animal kingdom! One study conducted showed these ants closing their mandibles with speeds between 78-143 mph. The jaws are so small that they close within 130 microseconds. Just as a reference, there are one million microseconds in just one second. Another reference, humans blink about 3 times per second. Theoretically these ants could close their jaws 7692 times per second. Not only is the speed insane, but so is the force. 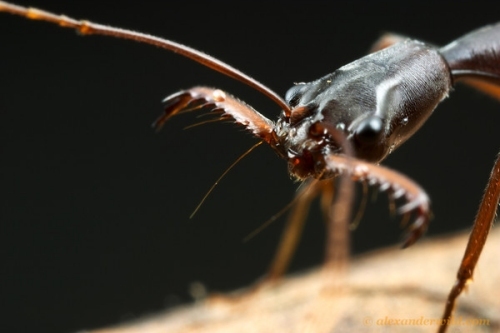 The peak force exerted was in the order of 300 times the body weight of the ant. This is amazing; it’s like they are spring-loaded. Plus, these ants not only use these jaws for catching prey, but they also use them to escape from predators. These ants have been observed to use their jaws as a catapult to eject intruders or fling themselves backwards to escape a threat or a sting. These ants can be found Central to South America, Asia, Australia, and Africa. 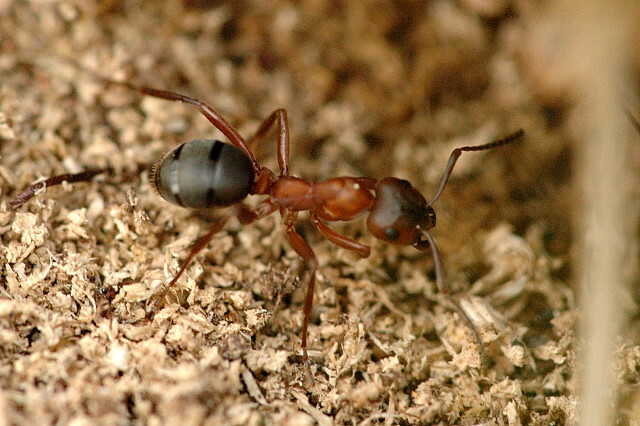 Some ants of this species even live in the southern United States. These ants have been seen in Alabama, Florida, and the Gulf Coast. I guess a lot of ants live in Florida, and a lot of grandparents too. (That was a pun). A millions insects? Or a single creature? When ants get together they form sort of a super-organism. They work together very much in sync. Army ants, from the rain forests of Central America, eat everything in their path. They take ant social behavior to the absolute extreme, they move and hunt like a single predator; one autonomous being. Individual workers are like cells in the human body, some are specialized just like the cells in our body. Anything that stands in their way will be overwhelmed. Army ants have large scissor-like jaws called mandibles. They use them to cut their prey into pieces. They don’t eat and then digest. At the same time they are cutting their prey, they secrete a dissolving acid that liquefies muscles, tendons and other tissues so that they can eat during the attack and move onto their next prey sooner. Army ant are fast, so most prey can’t outrun them. Therefore, the only defense it to not move at all. Army ants are nearly blind and they can only faintly see the difference between light and dark. They detect prey by movement and the smell of pheromones. Some of the ants are scouts which go out and forage for food. If they find something they will release a specific pheromone that will call the other ants for reinforcement. They can easily kill bugs more than six times their size. Some prey is carved into pieces and toted back to the colony. With their numbers they can carry pretty much anything. Actually ants are so numerous that they outweigh all humanity. Army ants are not one type of ant, it is just a term to describe the over 200 species of ants that form predatory groupings that raid an area in a huge group simultaneously. Unlike some other ant colonies, they only have one queen. Scientists think that the reason why army ants act so much as a group is because they all rely on one queen to extend their progeny. The fact that all of the worker ants (which are mostly female by the way) give up their right to reproduce makes the ants less autonomous and not at all likely to leave the colony and go off on their own. You can tell the queen of arm ants just by looking at her. She is much bigger than the other ants and has a very enlarged gaster. Queens will mate with multiple males and their enlarged gaster allows them to produce 3-4 million eggs a month. This results in an enormous brood that are all synchronized in development and that are all related to a single queen, meaning they share most of their genes with their sisters. To only way a colony can get a new queen is when about every three years a colony will get too big to continue and at this time it will split off into smaller colonies, each having a new queen. Conversely if a queen of a colony dies, that colony can join another colony. The nesting habits of army ants are also interesting. They do not build nests like most other ants. 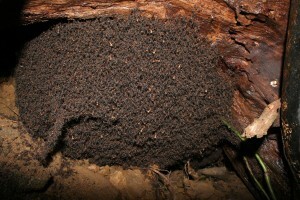 Instead, they build a living nest with their bodies known as a bivouac. They tend to locate themselves in tree trunks or little burrows. The members of the bivouac apparently hold onto each other’s legs and build an organized ball-type structure. The oldest workers are on the outside because they are the least valuable, while the queen and brood are farthest interior. When the ants on the outside sense a disturbance, soldiers are quick to gather and are ready to defend the nest. This week I want to talk about another really interesting parasite that infects ants. And yes, it is another nematode. Nematodes are crafty little creatures, because instead of controlling ant behavior, the Myrmeconema neotropicum controls an ant’s appearance. 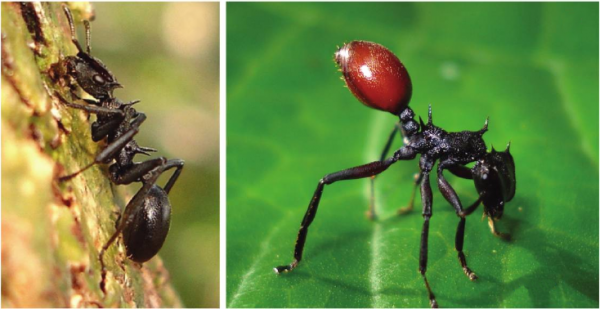 As you can see from the first picture, the ant Cephalotes atratus on the left looks the way an ant is supposed to look. However, the ant on the right has a red, extended gaster. This is because there are multiple nematodes inside of that part of the ant’s body. The second picture shows an ant on a plant with some berries. Yes, there is an ant in this picture. But doesn’t it camouflage well with the berries? At first glance you may have mistaken his swollen gaster for a berry. This is exactly the point. Birds see berries and want to go eat them, and when they see this ant, they think it is a berry as well. Even more interesting is that birds easily pluck the gaster right off of the ant. The gaster of an ant with Myrmeconema neotropicum inside is I think about 15 times easier to pull off, than the gaster of a healthy, non-infected ant. 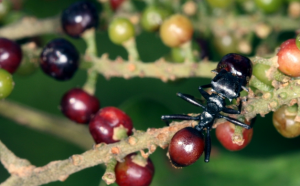 The whole point of this is that the body of the ant is a bit spikey and the ants can bite to try to defend themselves against the bird and therefore if the rest of their body stayed attached to the gaster, the bird would have a more difficult time eating it, especially once it realized it wasn’t a berry. However, this doesn’t happen, and the gaster detaches easily, allowing the bird to better enjoy its snack. So how do the nematodes make the gaster resemble a berry? What happens is they lie just below the ant’s cuticle (their skin basically) and cause a reddish tint. 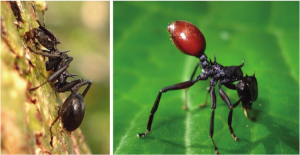 The actual parasite is yellow, but when seen through the black exoskeleton of the ant it looks reddish in color. So why is it so important for the bird to eat this ant gaster? Well, because that is the only way the parasite Myrmeconema neotropicum. Ants eat bird poop (containing the adult worms) because it is rich in nitrogen. After they eat it, the adult worms mate within the gaster of the ant pupa. As the ant gets older, the male worm dies while the female worm develops eggs. These eggs are what is seen through the gaster, so then a bird can mistake it for a berry, and the lifecycle continues. Parasites are so interesting, just the evolution that goes into creating these relationships is fascinating. It is interesting to think that the each specific nematode species has found such a small, specific niche (the infection of only one ant species) to carry out its life. The smart parasites don’t just latch onto a host and drain it of its nutrients so that it eventually dies with the parasite stuck in the host. No, ingenious parasites control, change, use, or manipulate their hosts just long enough that they can reach the next step in their life cycle. The other day I learned about an interesting new species of ant, the Formica sanguinea. This ant has the unique ability to secrete formic acid which is an adaptation that allows them to behave rather uniquely as a species. This ant is most interesting because it is a slave-maker ant, meaning it is an ant that makes other species of ants its slaves. Colonies of this ant can either live on their own or be parasitic. To start an enslaved colony, a fertilized F. sanguinea queen enters the nest of the host ant species and kills their queen. She then will make all of the workers of the host colony tend to her brood, essentially enslaving them. Then, the F. sanguinea workers will be free to raid nearby nests. This raid entails of stealing the other colonies’ larvae and pupae which are taken back to the nest and forced to become future workers for the F. sanguinea. Not only to these raids provide workers, but they also provide food! 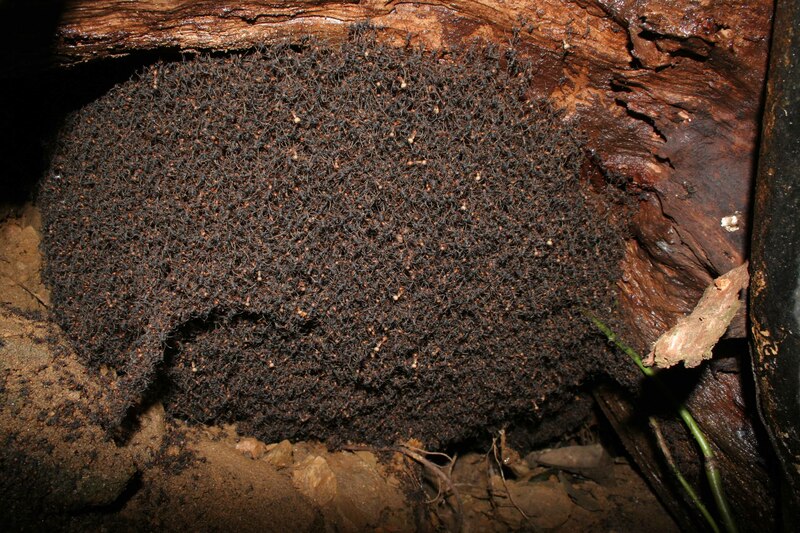 If a member is killed during the raid, individual ants will carry that carcass back to the nest to be eaten later. During a raid ants will dig and fight at the target nest. Then both slaves and slave-makers will carry brood back to the slave-maker nest. Interesting fact, raids never take place on rainy or overcast days because the weather conditions decrease the effectiveness of alarm pheromones. Chemical effectiveness is important because F. snaguinea use formic acid and substances from the Dufour’s gland as a chemical defense. The substances in the Durfour’s gland contain hydrocarbons that serve as wetting agents before the formic acid is released. These substances in conjunction with one another dissolve the fat compounds of the epicuticle and they enter the tracheal system to kill opposing ant. F. anguinea can tell if an ant is opposing or on the same team by analyzing the hydrocarbons on the cuticle of another ant. Surprisingly, even though the ants can tell their own colony apart from others, they cannot tall when an opposing colony is pure F. ganguinea. This means when a mixed F. sanguinea ant colony and a pure F. sanguinea colony meet, there will be aggression and fighting. This is most likely because the identifying hydrocarbons change when individuals are in a mixed colonies. Another interesting thing about this ant is that they are one of the few species of ants that are not eusocial. If you remember from my first post, eusocial groups have to have a caste system by which their social structure functions. They are not eusocial because scientists have never observed any occasions in which certain individuals raid and others forage. However, some individuals do have more Dufour’s gland compounds than others.